The advantage of internal ball circulation nut is that the outer diameter is smaller than that of external ball circulation nut. Hence it is suitable for the machine with limit space for Ballscrew installation. 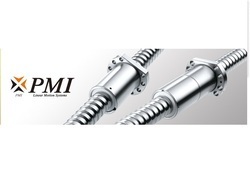 Being a customer oriented organization, we are deeply engaged in offering a wide array of PMI Ball Screw. PMI Ballscrews are machined, ground, assembled and Q.C. inspected under the constant temperature control (20 ) to ensure high precision of Ballscrews. accuracy inspection certifi cate.